Also known as the ‘festival of lights’, Diwali is a five-day festival that is celebrated by Hindus, Sikhs, and Jains, each of whom have their own specific traditions and customs in celebrating. But the one theme that is constant throughout is the concept of light conquering darkness and good conquering evil. Participants celebrate this with huge fireworks displays, decorate their houses with traditional rangoli artwork, and earthen diya lamps. The celebration of Diwali is deeply rooted in legends and old religious scriptures such as the Puranas. The holiday is celebrated in honor of the Hindu goddess of wealth and prosperity, Lakshmi. It is also celebrated in honor of the return of the Lord Rama and Sita after their fourteen-year exile and defeat of captors. In emphasizing the power of good over evil, Diwali honors the defeat of evil Narkusur, a demon of filth, by Lord Krishna. From a Sikh standpoint, Diwali is celebrated to honor the return of Guru Hargobind Ji from captivity. Jainists celebrate Diwali to commemorate the final release (Nirvana) of Lord Mahavira soul, who established many fundamental texts of Jainism. Each day of the five days of Diwali is meant for a different way of celebration. The first day is traditionally reserved for shopping as Diwali is a holy time to buy new things. The second day is used to set up the home, clean, and decorate for the big celebration on the third day, when festivals, feasts and friends are abundant. The fourth day is meant for spouses to exchange gifts while the fifth day is a time for brothers and sisters to enjoy eachother’s company. While many countries around the world hold celebrations for the festival of lights, there are some countries which have designated the celebration as a national holiday. 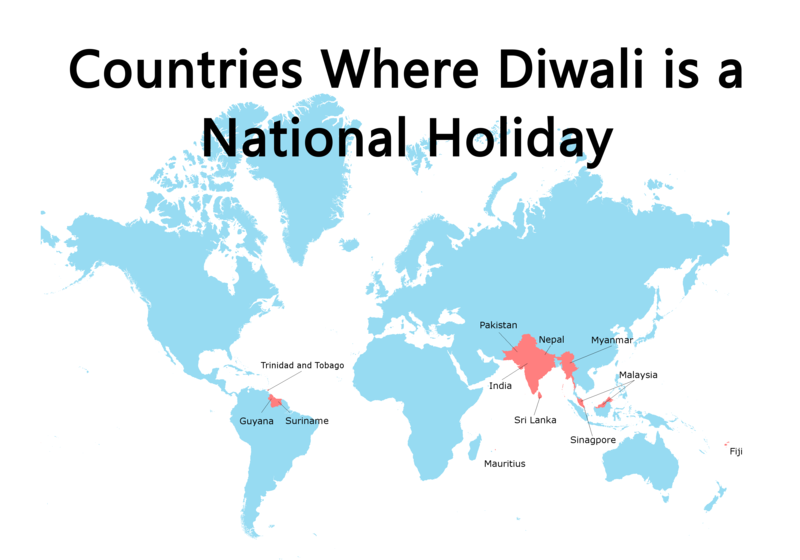 Today, India, Trinidad & Tobago, Myanmar, Nepal, Mauritius, Guyana, Singapore, Surinam, Malaysia, Sri Lanka, and Fiji all celebrate Diwali nationally. Though the UK does not recognize Diwali as a national holiday, the town of Leicester hosts the biggest celebrations outside of India.